Programs with online and face-to-face content where the student works with a theoretical-practical methodology in projects with real companies. Official qualifications, One Year Courses, Summer Courses, MAs. The most extensive and innovating training in space design, interior design, exhibition set-up, stage design, window dressing, home design, virtual reality and augmented reality. Official training, postgraduate courses and summer courses in design, creation and development of objects on the basis of their relationship with the user. Create technological and electronic furnishings, accessories, toys and packaging for industrial production and self-production. Training in design and furniture. Learn to master tools and processes such as 3D modelling, prototype development, production management, installation and maintenance of quality systems and technological resources devoted to fashion and furniture design. Official qualifications, MAs and postgraduate courses in graphic design. We train professionals who are able to devise new forms of visual communication and reinvent the role of the image in our society. Postgraduate courses and MAs in the areas of advertising and marketing. Train as a professional in digital marketing, online communication, event management, fashion communication, commercial communication, e-business, etc. Innovation is the main value in our training. Specialising in new design models, open innovation, business innovation, design thinking, strategy, etc. Training that will enable you to become a professional in the world of communication. Find your training programme in communication management and marketing, fashion communication, advertising, online marketing, etc. Training oriented towards developing interfaces that are useful, usable and desirable from the customer’s point of view, and effective, efficient and distinctive from the supplier’s point of view. Master’s Degrees and Postgraduate Courses that provide the tools and strategies necessary to immerse the student in the business world and to ensure the viability and impact of their projects. Masters courses that apply future-oriented design principles with the aim of increasing the qualities of innovation and competition in an organisation. Masters courses that provide a deep understanding of the concept of sustainability with the aim of describing and defining the status, factors and challenges of art in the science of sustainability. Learn to draw in 2D and 3D. Our official training and Illustration and Animation courses offer comprehensive training for future professionals with a wide knowledge of specialised digital tools. Learn the resources to develop digital design and the technological tools to train as a front-end and back-end programmer with our official qualifications and courses. Train in fashion style design, image consultancy, and personal shopping with our official qualifications, diplomas, summer courses, postgraduate courses and MAs. Turn your passion for fashion image into a profession. Official degrees, postgraduate courses, summer courses and MAs. Train in the different fields of fashion design with a varied training programme on offer: haute couture, prêt-à-porter, pattern-making, accessories, image fashion, communication, tailoring and style design. Official qualifications and postgraduate courses in handbags, jewellery and footwear. Develop your creative potential with a journey through the different stages in one of the most exclusive areas in fashion: accessories. Industries that combine the creation, production and commercialisation of creative contents that are intangible and belong to the cultural realm. Design-based training for innovative companies. Training in window dressing and stage design linked to interior and spaces design. Learn to project and get to understand the importance of colour and lighting and the relationship between objects and space. Courses and IED-specific qualifications specialising in projects linked to new technologies and the creative industries. Learn to use the new tools of communication and contemporary culture. Official qualifications and postgraduate degrees in fashion management. The best specialised training in management and business so that you can be a success in the fashion business and lead your own projects to positive outcomes. Courses and qualifications specialising in the flow of digital design, from CAD software to the use of fast prototyping CAM machines applied to different areas of design. Why train at IED Master? What does it offer professionally? Digital tools and interactive behaviours for working and creating soft surfaces and textiles. Under the concept of New Skins, we address the use of textiles at different scales, which may be applied from the scale of the object, to the human body, to rooms or even an architectural façade. This course responds to the current need in design to create increasingly interdisciplinary work teams. Throughout this master, you will learn about three key areas for achieving an advanced and up-to-date use of textiles in your projects. In the first part of the master, you will explore the complex geometries and designs allowed by digital design and manufacturing. In the second part, you will learn to integrate smart behaviour to textiles through soft electronics and programming in order to complete the master learning about the most advanced contemporary materials, how to work with them and how to create new materials. You will learn at the same time as you complete your projects through the Learning by doing methodology, together with the knowledge of the best international teachers and with the facilities of the Fab Lab IED Madrid, to which you will have free access throughout the day in order to perform your prototypes and experiments. Create new non-standardised specific solutions to particular problems. Gain a broad vision of current technology processes applied to textiles. Work on your designs with complex geometries and virtual simulations. Control a digital workflow in both the design and the production of your projects. Equip textiles with smart behaviours using soft electronics and programming. Make textiles interact with their immediate environment and the people who wear them. Ability to discretise new materials and create new materials. 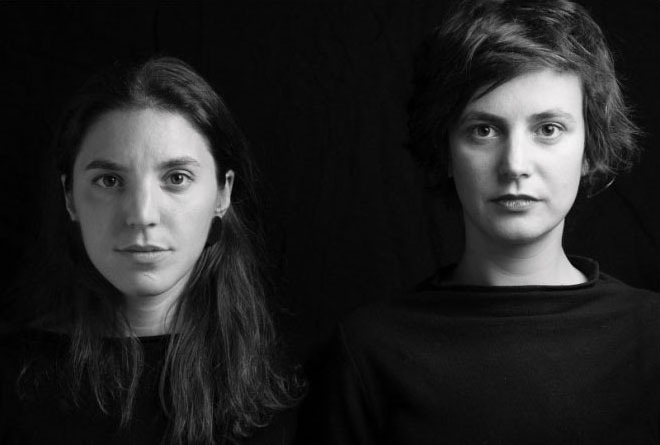 ZAP&BUJ is a platform that works at the intersection between Fashion and Architecture founded by Elena Zapico and Raquel Buj. With extensive experience as architects and fashion designers, their recent projects include Wall Dress, winner of the Samsung Ego Innovation Project in 2017 and Vogue’s Who’s on next competition in 2018, where they were finalists. In her solo career, Elena Zapico has worked with renowned designers such as Sybilla and has coordinated fashion shows for designers such as Santiago del Palacio and Amabel García. Raquel Buj has received several international awards for her architectural work as part of her Buj+Colón studio, most notably the 11 March Memorial in Madrid. As designers we want to make the future happen. Our focus is concentrated on implementing and improving any object, space, garment… Technology, which is moving increasingly closer to the body, helps us in this objective by providing new possibilities for interaction with the environment. If we also merge it with more handmade aspects, we will enhance the value of each product. We can state that this encouraging “experimental future” appears at the meeting points, at the crossroads, between disciplines and, in short, in the merging of an increasingly human technology. With the Master in New Skins: smart fabrics & wearables, you will learn everything you need for applying technology to textile design and prototyping processes through the three areas developed in the master: geometries, behaviours and materials. The approach of the master lies in developing practical skills applied directly in the Fab Lab, where you will perform an ongoing development of the theory seen in the classes, which will allow you to experiment and develop your own processes for applying them in future projects. The master concludes with a Final Project in which you will perform a cross-disciplinary application of all the knowledge learned over the different specific modules. Why study at IED Innovation Lab? The IED Innovation Lab is an international networking centre focused on promoting a dynamic collaboration between disciplines, interaction with professionals, hybridization of concepts and prototyping results. The centre operates around LABS where experts from different fields explore the future of design working with the latest technologies in digital fabrication, electronics, media production, virtual reality, etc. It is located in what is considered the new creative district of Madrid, 20 minutes by underground from the other IED spaces. The neighborhood offers largescale workspaces where new designers can work freely, taking advantage of the premises’ great functionality. Timetable : Morning-Afternoon Practical Classroom Schedule: Mon to Thursday, 2-3 days at week, from 7:00 pm to 10:00 pm. Workshop schedule: Saturday and Sunday, one weekend at month. Online Classes Schedule: Friday from 4:00 p.m. to 8:00 p.m. and Saturdays from 10:00 p.m. to 2:00 p.m. Directed to : fashion and product designer, architects, designers interested in implementing soft material skills in their disciplines.